We’re pretty much all in agreement that fast fashion has to be taken out and put in the trashcan. The one for recycling, naturally. We all know that the current pattern of consumption is ludicrous and damaging to the environment and not sustainable at all, on any level. Producing clothes that are so cheap that you don’t even care if they only last a wear or two only makes sense for those making the profit. Which is why I am always looking for those wanting to think differently. Is slow fashion the opposite of fast fashion? I think unfashion is a better description. Sustainable, quality garments that are made to last. To allow the sort of relationship people had with their clothes before the clothes became cheap, where you had something made for you, from the best cloth you could afford, and you took care of them, repairing them if they became worn or damaged. 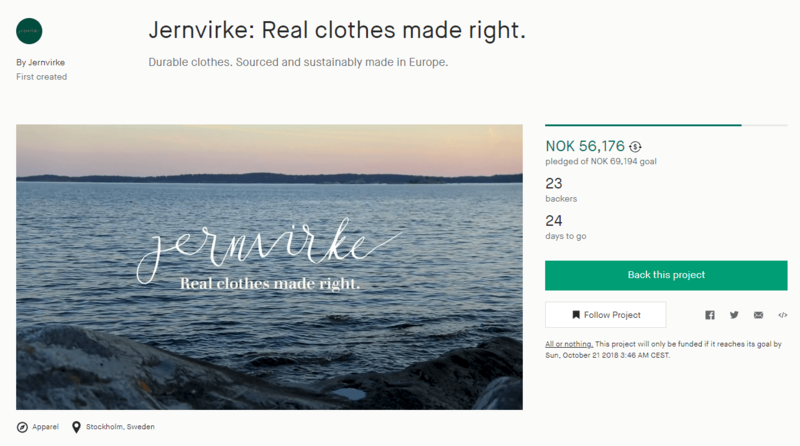 And this is where new Swedish brand Jernvirke comes into it. I only discovered their Kickstarter yesterday but found myself really enamoured by their humble approach. A low key approach, no loud proclamations. Heck, they’re not even trying to fund a million kroner to get off the ground. After spending two years tweaking their designs for a shirt, a jacket and a pair of trousers, they’re ready to start. And the result looks surprisingly wearable and smart. The designs are primarily based on vintage Swedish workwear from around 1900. I guess around that time workwear was what you wore when you weren’t wearing your Sunday best, so let’s describe it as just clothes. The sort of clothes you had for a long time. And for them to be so they also had to be properly made from sturdy fabric. In this case, it’s about linen, grown and woven in Belgium. The linen looks sturdy and strong, with a really organic selection of colours. The environmental impact of growing and processing linen is very much less than for cotton fabrics, so a good choice from a sustainability point of view. It’s also been in use for at least 36.000 years. Working with a family-owned factory in Lithuania bodes well for the quality of construction. Lithuania is literally the closest place to produce to their base in Stockholm, and like Norway, Sweden really has very little industry like this left now. Is there a market or need for clothes like this today? For one, you can count me in. I think the designs look great, the fabric, colours and construction look spot on, and the price is really not much more than you’d pay for items of lesser quality. Their Kickstarter runs until October 21st and is almost fully funded now, but take a look anyway and tell me it doesn’t speak to you. The Jernvirke website is here and their Kickstarter is here. Read this post several days ago but have only just got round to looking at the links. I really really like their shirt – could just imagine wearing that pink one on the bike….. Wish i caught this project sooner, love those chinos.